Atlas Pizza is located near the corner of SE 36th and Division in Portland, Oregon. Yup, I've been on a pizza bender as of late, and I'm sure Portland Pizza Week (April 18-24) had at least a little to do with this. OK, probably everything to do with this. I've passed by Atlas Pizza before, but had never tried them out until Portland Pizza Week. 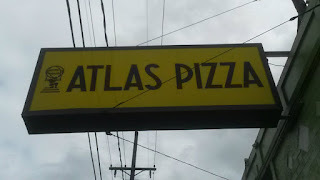 Typical menu for a pizza place again; mostly pizzas, salad, and sodas/beer. 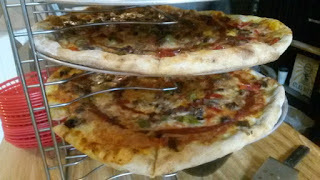 Whole pies here come in 12" or 18" sizes. Of their regular specials, the Titan (including pesto base, feta, and artichoke hearts, among other toppings); the Jalapeno Popper; and the Big Joe (house-made meatballs, ricotta, and basil) appealed to me the most. During Portland Pizza Week, their special $2 slice was a Whiskey-Soaked Smoked Brisket Pizza, Smoked Provolone, Roasted Bell Peppers, Caramelized Onions, and Bourbon BBQ Sauce. 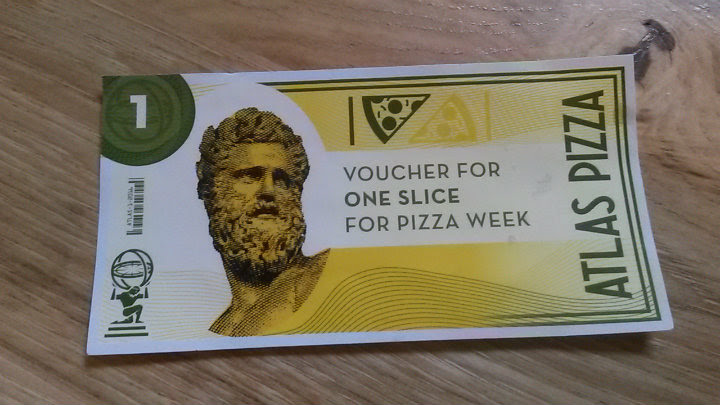 After paying, I received a voucher to give to another worker so that I could get the slice of pizza. Fun. 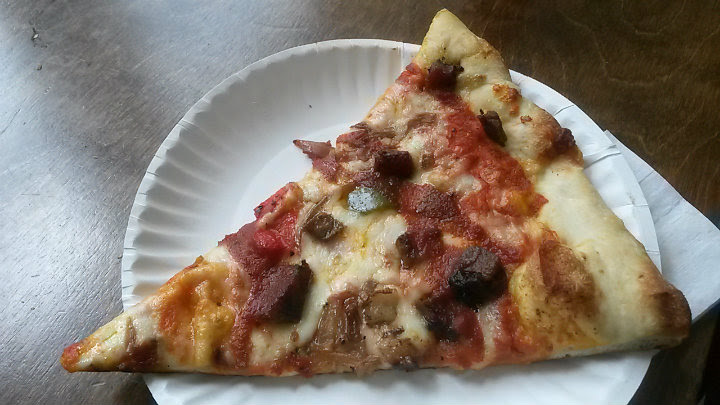 Another solid slice here. 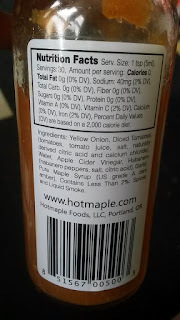 That BBQ sauce was front and center. 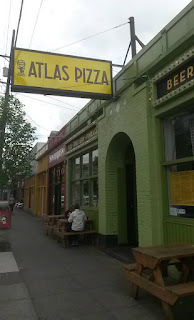 I also liked that the crust at Atlas Pizza was not greasy, a common theme that can be found at other pizza joints. And still a good crunch after a minute of reheating in the oven. 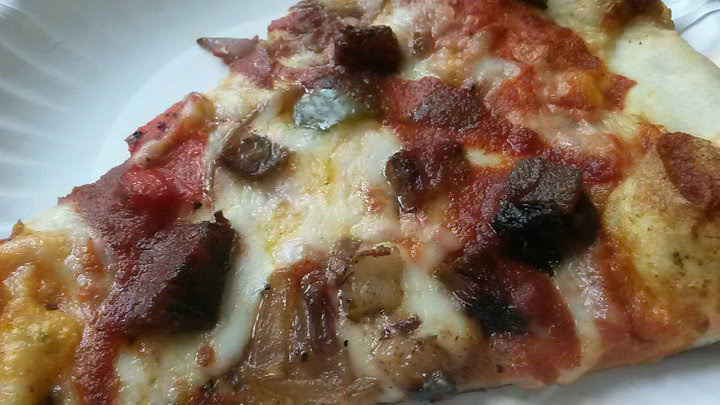 There wasn't a whole lot of brisket on the pizza, but when you're selling good-sized slices for just $2, I probably shouldn't expect it to be laced with meat. 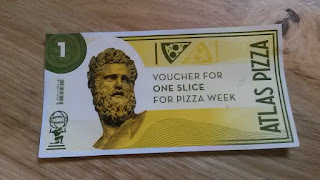 However, I would like to see this back as a special one day, with loads of shredded brisket on it. I'd certainly pay a reasonable amount for that. 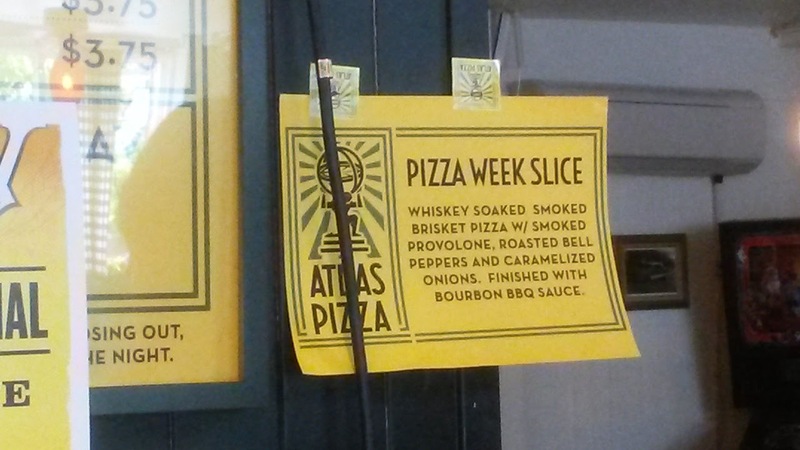 Atlas Pizza had a few hot sauce options available. Again, to my delight, some local options. 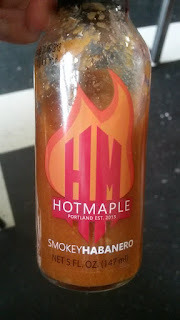 I tried the Hot Maple Smokey Habanero hot sauce here, made in Portland. A bit of sweet and tang, not a lot of heat. Still paired darn well with the brisket pizza.